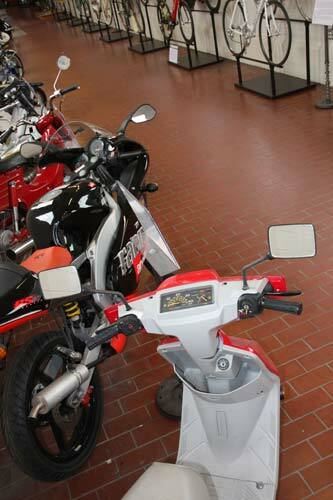 At first glance, this Yamaha Scooter may not appear to be anything special. Upon closer inspection, you will see that it only has .3 of a mile on it. In fact, it has 10,000.3 miles on it as the speedometer has turned over. This is a regular scooter with a special story. Steve McCarthy received it as a Christmas present from his parents in February 1993 when he was 14 years old. 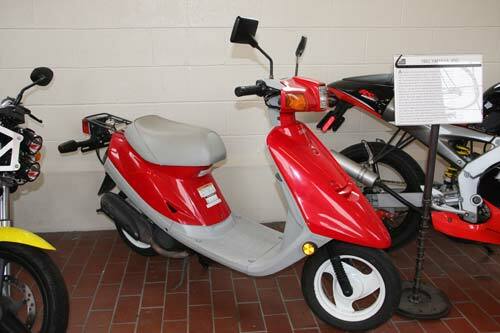 The scooter was purchased from America's Motor Sports in Nashville, TN. Steve was ecstatic about this gift because he had always been a "car guy." It also gave him the independence of driving before he was 16. Steve put about 2,500 miles on the scooter the first two years of ownership. Upon turning 16 he started driving a car, and the scooter sat idle until his junior year at Tennessee Tech University. Being a poor college kid, Steve put the scooter back in use for the next two years of school. The $1.00 fill-ups at the gas station were a good fit for his budget. By the time Steve graduated the scooter had 6,000 miles on it. In 2006 Steve got a job at Nissan and was only six miles from work, so he put the Jog back into service. Recently, he purchased a bigger scooter, but wanted to continue driving the Jog until it reached the 10,000 mile mark. Steve reached this mark on 10/10/10, and decided at that point to begin using his new scooter. Steve wanted the Jog to go to a good "home" so he has generously donated it to the museum. As Steve pointed out, it is very unusual for a scooter to last for 10,000 miles, but he always took very good care of it, and it certainly shows; 17 years later, it is still in excellent condition.